Welcome to reality: royal genealogy lessons, needlepoint, acting like “a proper lady,” and — worst of all — a prince who is not the least bit interesting, and certainly not charming. When I read the synopsis, I thought this book sounded kind of like The Princess Diaries, which I love, so I was pretty excited to read Just Ella. Sadly, it became pretty clear after the first few pages that this book wasn’t what I was hoping it would be. 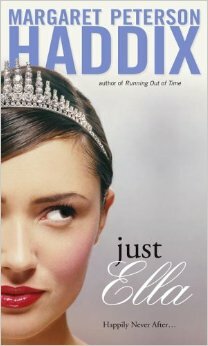 This book had one of the most annoying main characters that I’ve ever read. She was whiny and dumb. As the reader I picked up on things way quicker than Ella did and I had to wait pages for her to catch up. The other characters were so poorly written. Most of the side characters were intentionally horrible to Ella and they’re mean in the most ridiculous ways. Right away, Ella gets in major trouble just for starting her own fire early in the morning because she was cold. It’s so over the top and laughable. There was cliché after cliché all though out this book. The girl power was weak and not empowering at all. And I was mildly bored though out the whole book. I think with some work, this book could be turned into something awesome. But overall, Just Ella wasn’t for me.